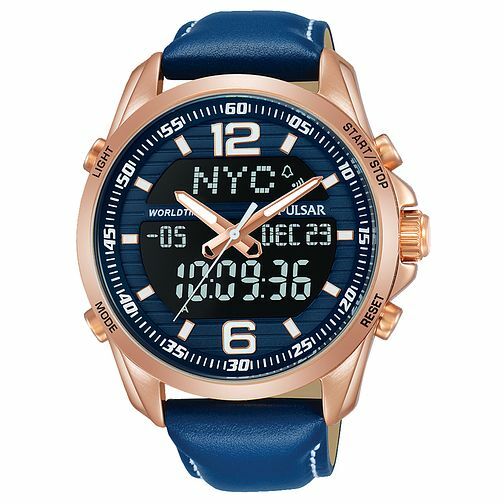 You'll not go unnoticed wearing this stunning rose gold with blue sports analogue digital watch from Pulsar. Constructed in stainless steel with a rose gold coating this sports watch has a great many functions including: 100 hour stopwatch with split time and lap function, data recall, countdown timer, 3 alarms, 44 city world times, calendar and back light. Sporty rose gold luminous analogue watch hands point to rose gold hour markers with ease of legibility. Holding the case is sports orientated blue leather padded strap. 100m water resistant.